Unfortunately, a broken garage door spring is part of life. But it can also be dangerous. 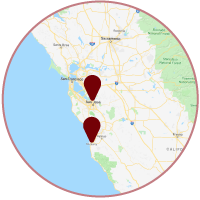 If you see broken spring on your San Jose, CA or Monterey, CA area home, call Aaron Overhead Door immediately for garage door spring repair. Do not attempt to use your garage door. Garage door springs also known as torsion springs are used to hold the weight of your garage door. There are different springs for different garage doors (based on size). The bigger and heavier the door the more expensive the springs. You can do a test of your own garage door to test the health of your garage door springs. Here is a 5 step test. Step 1: unhook the garage door opener by pulling on the release. If the door falls the springs probably aren’t balanced properly or on a decline. If the door wants to roll up when you let it go the springs are a little hot. This means that the springs are a bit tight and they should loosen over time a bit. When you need garage door spring repair, call Aaron Overhead Door. In San Jose, CA, call us at 408-684-6791; in Monterey, CA call 831-290-1765.